On 10 June 2011 the site was visited by BACTEC International, one of the world’s leading EOD, bomb disposal, & landmine clearance specialists. They had kindly agreed to undertake a geophysical magnetometry survey across sections of the site in order to ascertain the potential of ordnance contamination. 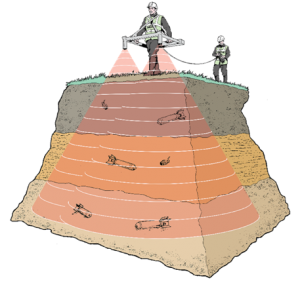 We have worked with BACTEC on many occasions over the past fifteen years, most recently on the Livens Large Gallery Flame Projector dig at nearby Mametz in May 2010 where the magnetometry results were highly successful. The numbers on the Bactec survey relate to individual anomolies. Each is listed in another section of the report with its percieved mass and depth. GUARD’s resistivity results can be seen to exactly mirror those of the magnetometry, giving the Mametz team a strong indication that the British trenches would be easily distinguishable in the geology. From the point of view of presence of potential ordnance, the Mametz results were less complex to read than those revealed by the survey at La Boisselle. Clear delineation of a chalk-filled trench in the clay of Mametz – May 2010. The key difference between the Mametz and La Boisselle sites is their respective geologies. At Mametz the overlying geology is clay to a depth of approximately 6 metres, but it was found that the trenches were predominantly backfilled with chalk spoil dug from nearby tunnel systems that had been used (in bags) to strengthen the parapet and parados, thus enhancing protection for the troops in the trenches. It appears that after the war farmers had simply pushed this material into the open trenches. As the photograph (right) shows, delineation of the trench within the surrounding geology was stark. 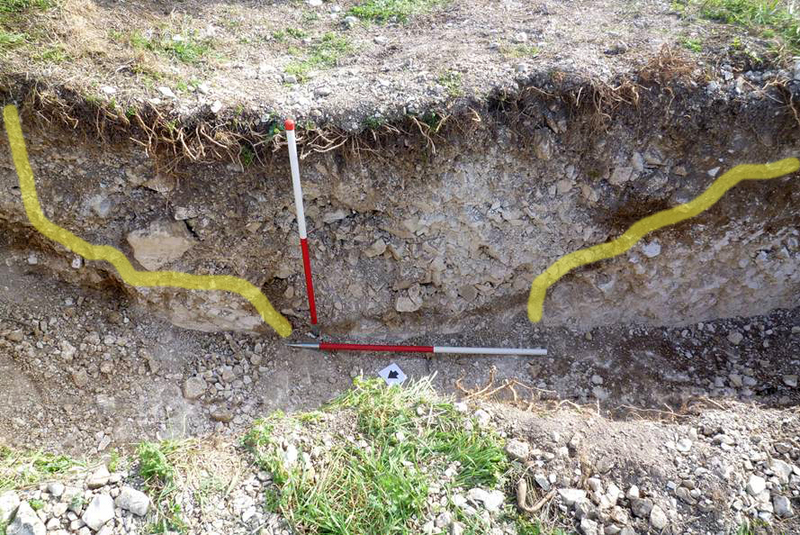 At La Boisselle the geology is chalk with a very small overburden of loam, perhaps just a few centimetres. A delineation is therefore less distinct. However, it appears that the colossal amount of chalk spoil removed from the tunnel systems and piled across the surface of the site during the war may have acted as a burster course, protecting the underlying natural geology from shell and mortar fire. Section through Quémart Nord trench at La Boisselle. 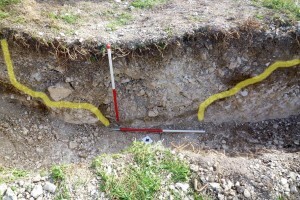 Initial excavations indicate that the post-war backfilling of the trenches, although consisting of a very similar material as the natural geology through which they were cut, is easily distinguishable partly by a small admixture of loam in the fill, but especially as a result of its extreme friability compared to the still very tough surrounding natural geology. Equipment used was an AGS-1 Total Field Cs Vapour Magnetometer system, specifically designed and built for UXO location and has been used extensively in Europe, Asia and Australia. This unit can be operated with DGPS for positional location and has a proven capability of locating a 500 kg bomb buried at 8 metres in depth. 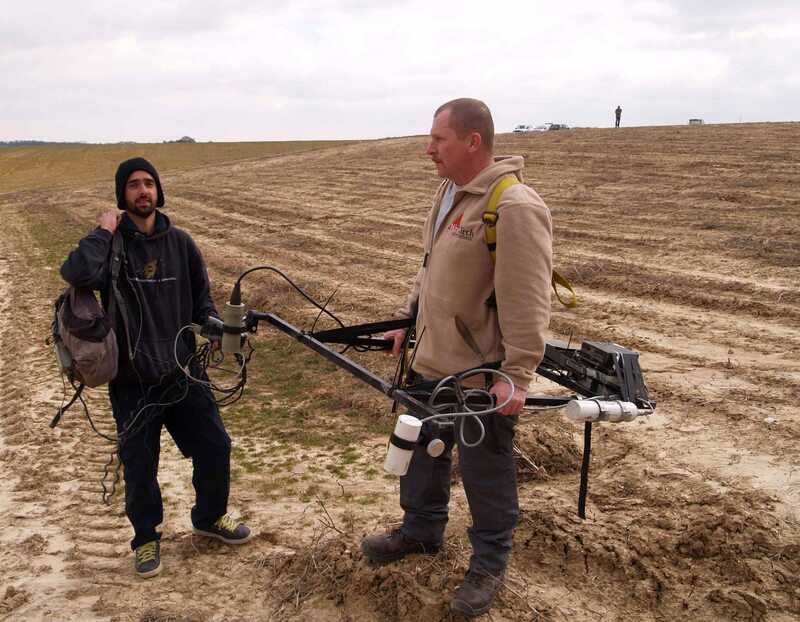 BACTEC personnel using the AGS-1 Total Field Cs Vapour Magnetometer at Mametz – March 2010. 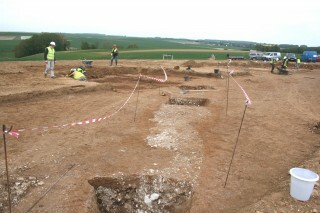 BACTEC were able to work in the areas behind the French/British and German front lines. 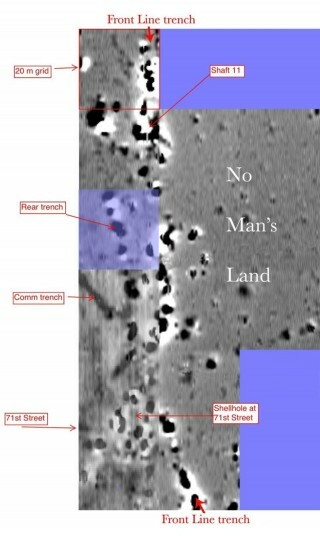 No Man’s Land, mainly comprising deep mine craters and dense scrub, could not be surveyed at this time. Magnetometry is one of many tools employed by ordnance clearance specialists. It is used in conjunction with additional ‘layers’ of geophysical techniques, which when combined give the clearest picture of what lies beneath the surface. The first ‘layer’ is archival; utilising trench maps, plans and documents. Next, Linesman, a system of plotting wartime trench maps by means of a GPS interface is employed. Only when these layers have been completed should magnetometry be undertaken. 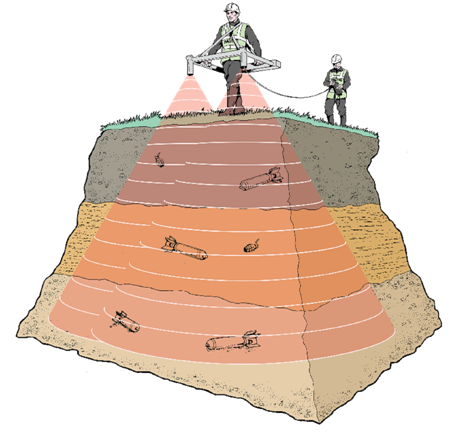 In turn it often followed by other non-invasive techniques including ground-penetrating radar and resistivity. Each layer cannot give appropriate levels of detail on their own. Only when they are combined can an overall picture be ascertained. 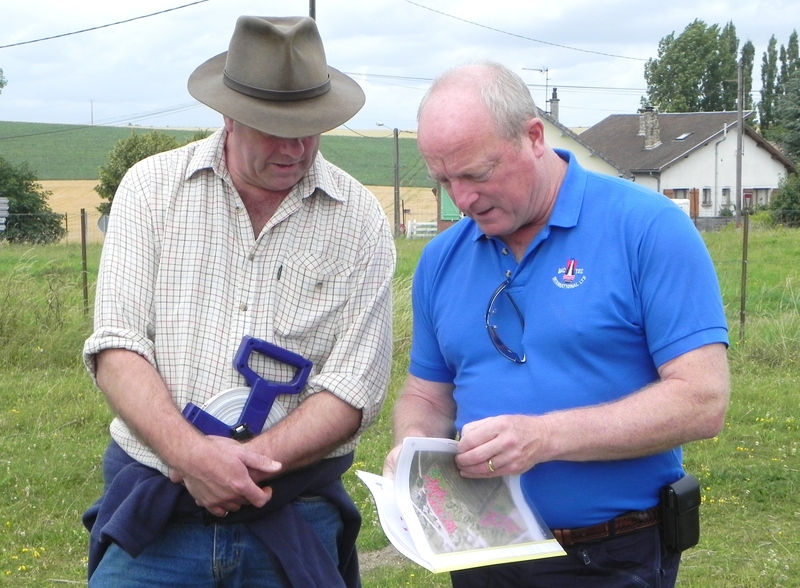 We were visited on site in July 2011 by ex-Royal Engineer Brian Todd from BACTEC. Brian’s experience includes sixteen years work locating and clearing WW1 and WW2 ordnance from Belgian beaches alongside a similar roles at sites near Ypres (Ieper) and Lens. He was able to explain the original survey results as we walked around each section of the Glory Hole. Initial results showed a ‘noisy’ site, heavily contaminated with ferrous objects. 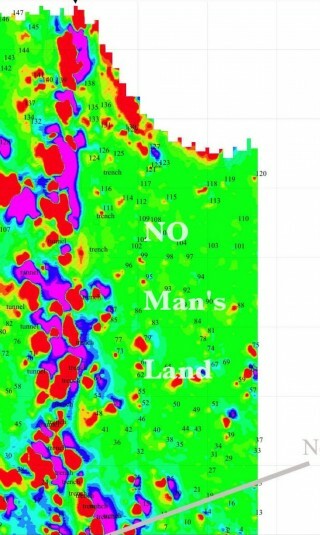 Areas marked in red emitted positive magnetic readings whilst those coloured purple showed negative. Areas with no magnetic reading at all are coloured green. All other colours are variations between neutral (green) and strong (red and purple). Black lines denoting potential linear features have been added to the image below. With unfiltered results individual ordnance is still difficult to pinpoint. In time various filtering options will be applied for both the Line Data and Gridded Data which will make anomalies easier to interpret. The current results are only a guide and require further filtering with specialist software to provide a clearer picture of potential areas of interest, which may include trenches, shelters and inclines. Unfiltered geophysical magnetometry survey results overlaid on Google Earth view of site. 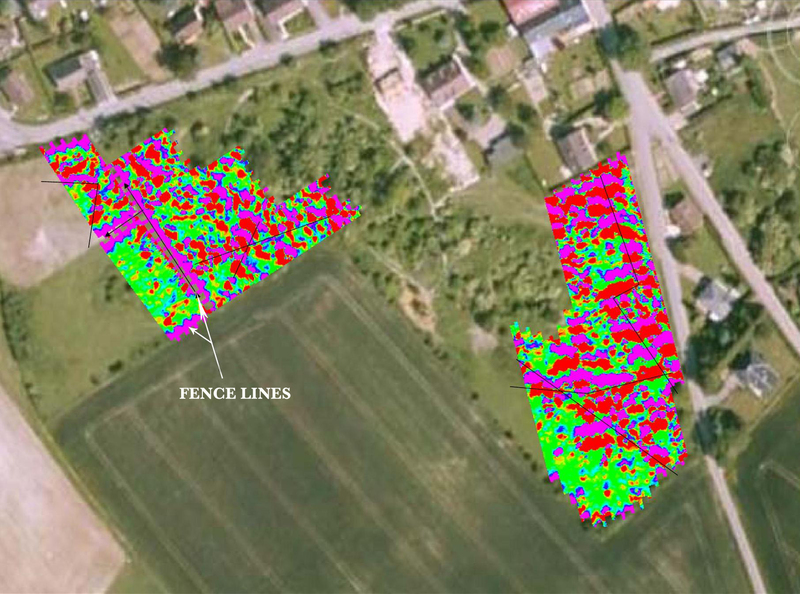 Existing fence lines are clearly marked along with black lines over possible linear features. I am trying to follow my grandfathers footsteps. I have get a copy of the war diary for 184 Tunnelling co. R E my grandfather transfered from the 1st Batt. Northumberland fusileers in Oct 1915 to the 184 formed at Rouen and moved to Maricourt (somme) 30/10/15 and moved on to Roclincourt 2/3/1916. I know the was on the Fish Avenue Tunnel but I can not find any referance to it I wonder if you could help. P S I am a member of Southend-on-sea W F A, and have had the pleasure of meeting both Peter Barton and Simon Jones.